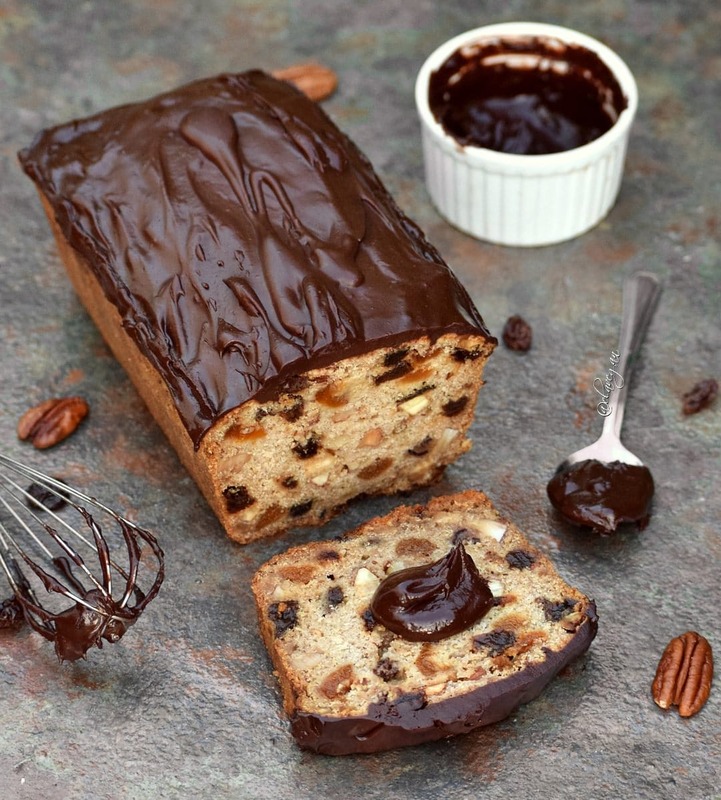 I know, I know, it’s January and Christmas is over but this vegan fruit cake with a delicious chocolate glaze can be eaten at any time of the year. If you live in a country where it’s super cold in January, well congrats! You now have the perfect excuse to make this yummy dessert. 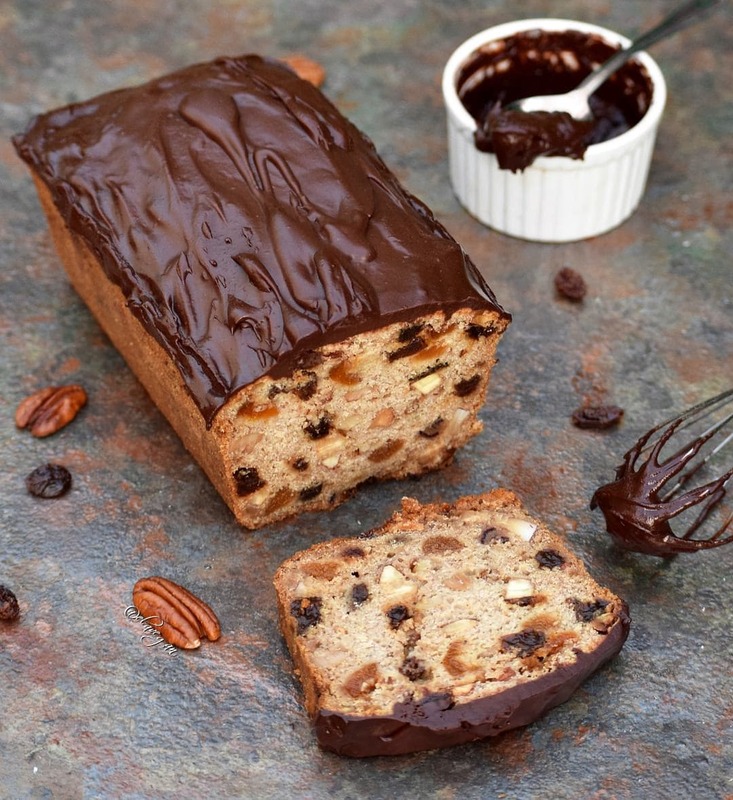 This fruitcake tastes best when you enjoy it in front of a fireplace with a big cup of hot chocolate. But as I wrote before, it also tastes great at any time of the year. So make it today, I am sure you will enjoy it as much as I do. 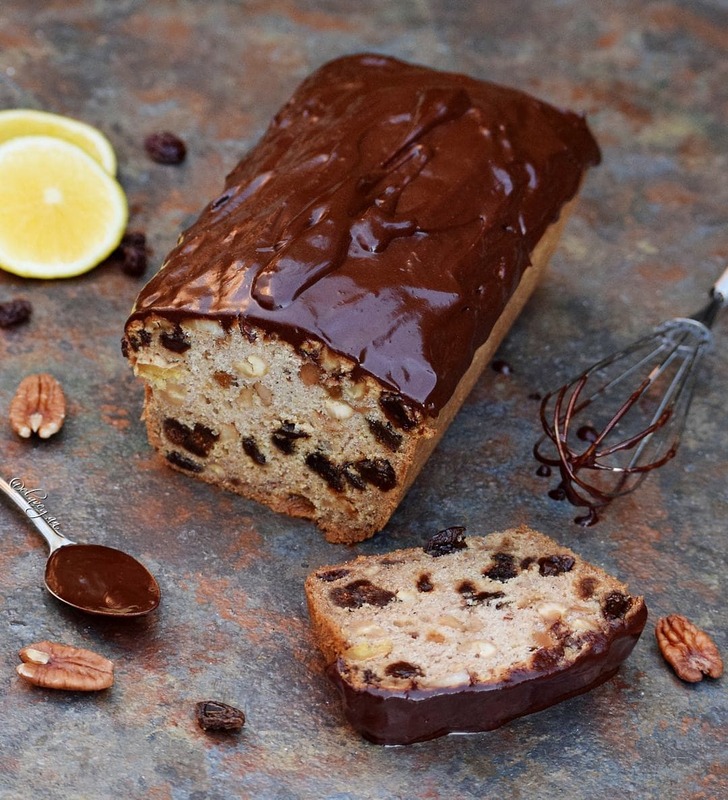 This vegan fruit cake not only tastes delicious, but it’s also easy to make. It’s packed with lots of dried fruits and nuts. I used dried apricots, figs, dates and raisins. 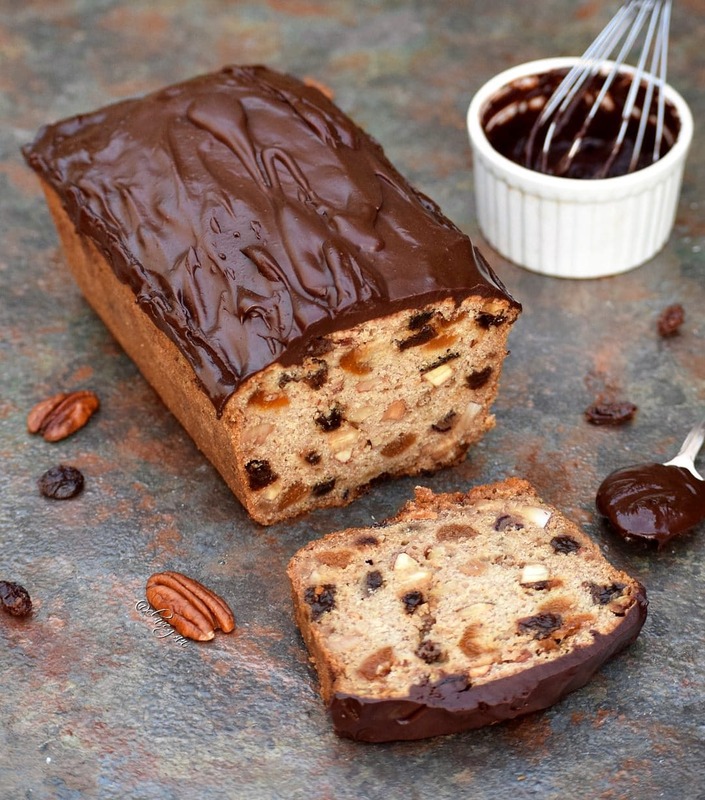 If you use more dried fruits in the recipe, the cake will turn out even more rich, moist and gooey. As for the nuts I used cashews, almonds, pecans, and pieces of coconut meat. You can, of course, use any other nuts like hazelnuts, walnuts or peanuts. 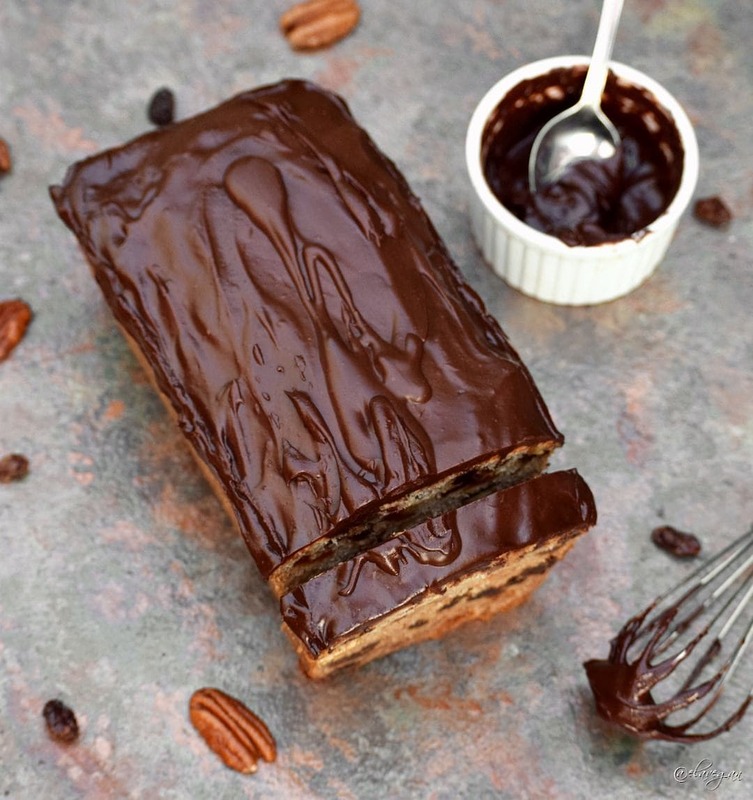 I poured a delicious chocolate glaze on top of this vegan fruit cake. And let me tell you, it makes it even tastier! You don’t have to add the chocolate on top but I can only recommend it. After all, chocolate makes everything better in my opinion. 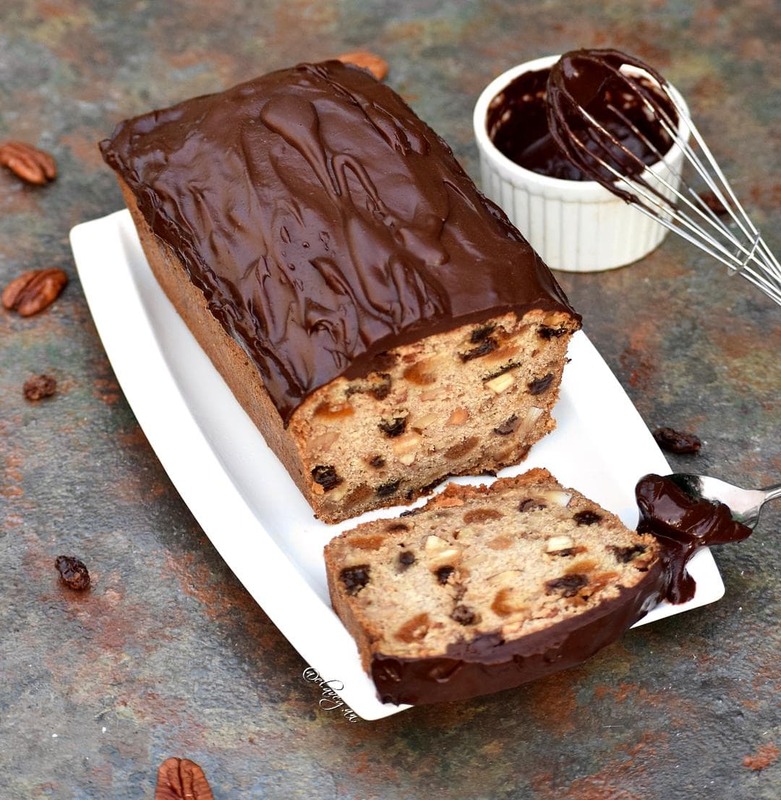 Boozy vegan fruit cake with so much flavor! This is my kinda cake!! I love that you actually used real (and some of my favorite!) dried fruits instead of those funky candied ones. Baking with booze is not something I’ve ever tried, but I’m very curious to taste what sort of flavor it adds. And that layer of chocolate glaze on top is absolutely irresistible???? Thank you Natalie! Well I actually hate these “funky candied” dried fruits. I never ate Christmas Stollen or Fruit Cake as a child because I hated them so much lol. I love real natural dried fruits though. You have to add some booze to your next cake. ???? This recipe looks amazing! Always looking for gluten-free baking ideas as we have family that have celiac disease. One question though – can I replace the flax eggs with real eggs? If so, how many would I need? Thanks!! Looking forward to making this.